The word seahorse is derived from the Greek hippocampus, which is a junction of the word hippos meaning horse and campus which does not mean ‘monster’ like some sources claim. Campus or kampos is probably derived from the Greek verb kampto (meaning: to bend) or kampti (meaning: bent). So it literally means ‘bent horse’. But in the ancient Greek world hippocampus was also used as a designation of a mythological sea monster with the head and body of a horse and the tail of a dolphin. The seahorse is excellent in camouflage and very difficult to detect among the branches of a gorgonian where they often gather in groups of around 20-30 individuals. 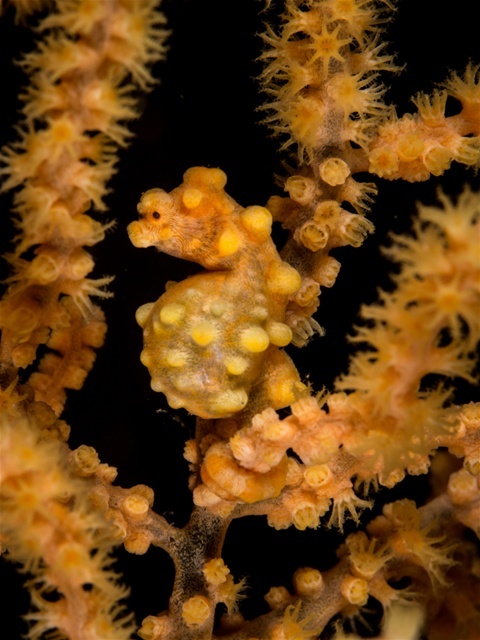 The pygmy seahorse (Hippocampus bargibanti; see picture by Robert Guild shown above) is smaller than 3 cm, has a short snout and very long tail. It is found in the entire central Indo-Pacific area. It has bulbous tubercles all over its body, that match the colour and shape of the polyps of the gorgonian of the genus Muricella. The pygmy's body and tail resemble the branches and stem of the gorgonian, while the tubercles resemble the retracted polyps. So its camouflage is probably more effective when a seafan is disturbed and retract its polyps, which could concurrently signal the seahorse that is now safe to hide in the gorgonian. Their tiny proportions and the ability to merge completely with the colour of a gorgonian was perhaps the reason why the pygmys were discovered only in 1970. H. bargibanti occurs in three colour morphs pink, yellow and orange, depending on the colour of the sea fan. Pink or red tubercles are found on the pinkish coral Muricella plectana and yellow or orange tubercles on the yellowish coral Muricella paraplectana. Does the seahorse choose a home that matches its colour, or does it change its colour to match its home? This question was solved when investigators found that young yellow pygmies that were born and raised in yellow gorgonians in an aquarium, changed their colour to red when they migrated to a pink-red gorgonian. Its hard to give an estimate of the total number of pygmy seahorse and population trends, but many are caught and dried as part of traditional Chinese medicine that believes in its power to cure all kind of physical troubles. Froese, Rainer and Pauly, Daniel, eds. (2006). "Hippocampus bargibanti" in FishBase. December 2006 version.